Because of its beautiful white colour, white gold radiates a timeless elegance. 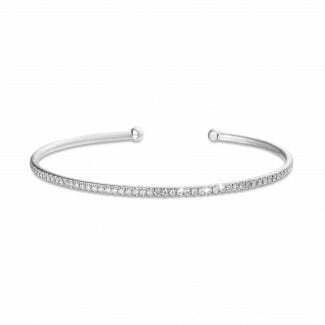 This ensures that a diamond bracelet in white gold is the perfect accessory for every outfit and for every occasion. In our collection, you can choose different bracelet designs, such as slave bracelets, satellite bracelets or the classic tennis bracelet. 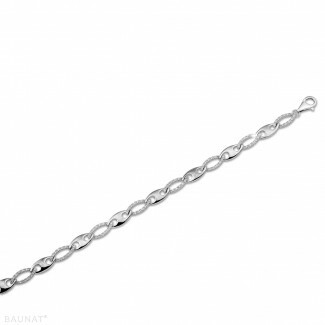 BAUNAT also offers diamond bracelets in platinum, yellow and red gold. BAUNAT was founded in 2008, and quickly became a key player in the jewellery and diamond industry. We are known for our excellent service and customer-friendliness. Do you want to buy a white gold bracelet with diamonds for yourself or for a loved one? Our experts will help and advise you throughout the whole process. Above all, you can be assured that your white gold bracelet is handmade using only the highest quality precious metals and diamonds. So take a look at our extensive collection of high jewellery also. 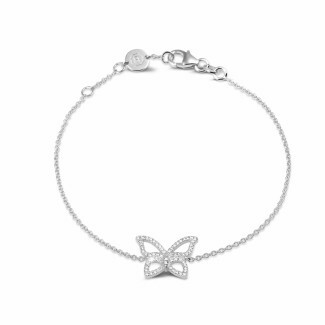 How can I buy my white gold bracelet online? Have you found the white gold bracelet of your dreams and would you like to order it quickly and easily? This is possible at BAUNAT. Our entire collection of white gold bracelets can be found and purchased online. As a result, you pay on average 30% to 50% less for your diamond jewellery than at your local jewellery. Shipping is also completely free and insured, and you are also entitled to a 30 day period in which to change your mind. If your bracelet does not fully meet your expectations, you can return or exchange it hassle-free. Buying a bracelet with diamonds is not something you can rush. Especially if you buy it as a gift for a loved one. Take into account their personality and style. Based on that, the BAUNAT experts will help you find the perfect bracelet. Would you prefer to create a tailor-made bracelet? We will assist you throughout the entire process, from rough sketch to finished product. Which precious stones suit a white gold bracelet perfectly? What can I engrave in my white gold bracelet? Contact the BAUNAT experts for advice or answers to any questions you might have.